Painting The Slav Epic, a series of 20 paintings, took Alphonse Mucha nearly two decades to complete. Its digitisation was much faster, taking the photographer, Jan W. Drnek, only two years. The result of this unique project is the precise scanning of the entire cycle, into ultra high resolution images, which account for every detail of the famous Czech artwork. „I was approached by the Albatros Publishing House, with the idea of creating a book as a piece of art. The original idea was based on the interiors of a religious building that I worked with. 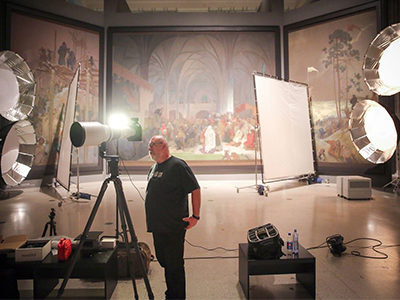 However, I suggested The Slav Epic and they liked the idea, „explains the photographer, describing how he was commissioned to carry out the work. “The Epic was due to be flown to Japan for an exhibition, around which the press conducted a lively debate surrounding the potential risk of damage to the work. I thought it would be good to kill two birds with one stone. Take a digital copy for the publication of the book and also as a backup, should any damage occur during transit, „says Drnek. The results of his work will soon be reviewed by the reader. How did the digitalisation proceed? In addition to high quality technical equipment, planning how to undertake the demanding photoshoot also had to be taken into account. Coordination with the normal day-to-day operations of the National Gallery, where the canvas belonging to the capital was exhibited at that time, had to be considered. „I must say that the National Gallery was very accommodating in that respect“ says Drnek. Drnek worked in the gallery almost every day, or to be more precise, every night. „It was an extremely difficult month for all members of the team who participated in the digitisation of The Epic,“ he recalls. „The feeling of being among the canvases at night in almost complete silence was very strange. Almost sacred. Moreover, the whole exhibition was masterfully designed, greatly enhancing the monumentality of Mucha’s work. Such places, whether it be a gallery, museum, shrine or temple, have a certain common energy,” the photographer adds. Shooting just one canvas meant taking hundreds of photos and then combining them into a single image. „The hardest aspect was preparing a methodology to devise a mathematical model of how to do it all,“ he says. While Tokyo’s hundreds of thousands of visitors, including the imperial family, admired Mucha’s genius and the history of the Slavs, Drnek spent hours at his computer. „It took half a year to process everything, connecting it to the computer,“ he adds. The monumentality of Mucha and Drnek’s work is highlighted by the numbers – one image had to be captured with 150 to 250, sometimes up to 350, shots. More than 20,000 images were processed. Data from one 810 x 610 centimetre image used more than 60 GB of computer memory. The result is already appreciated by restorers, who can sit down at the computer and see every brush stroke in detail. A regular viewer probably wouldn’t enjoy the work on a screen too much. „The whole Epic works the best. Now I’m looking for a way to bring its monumentality to smaller dimensions for publication purposes,“ he describes. The photographer now knows the work like few others. However, no breakthrough or mastermind’s mistake was revealed on the canvas. There was no time to look for details, the twenty images cover a total area of 650 square meters. „If I wanted to see them in detail, it would take another year,“ he explains. No hidden author’s „joke“, such as the famous fly on the knees of the Madonna at the famous Dürer’s Rose Festival, was uncovered. However, in order to be as faithful as possible to the original works, Drnek decided to carry out multiple shoots under specially modified lighting conditions. Canvas shows a strong anisotropy. Some parts of the cloth appear differently at different angles of view. Tens of thousands of photos and calculations were taken over several months. The most favourable conditions were used where possible, allowing greater resolutions to be used, resulting in even larger amounts of data. Instead of 60 GB, the highest resolution images are 90 GB in size, making calculations even more demanding. The work is painted from the point of view of the person standing before the scene. „At eye level, the elaboration of detail is greater than six meters,“ he says. From his point of view, there are big differences between the canvases. 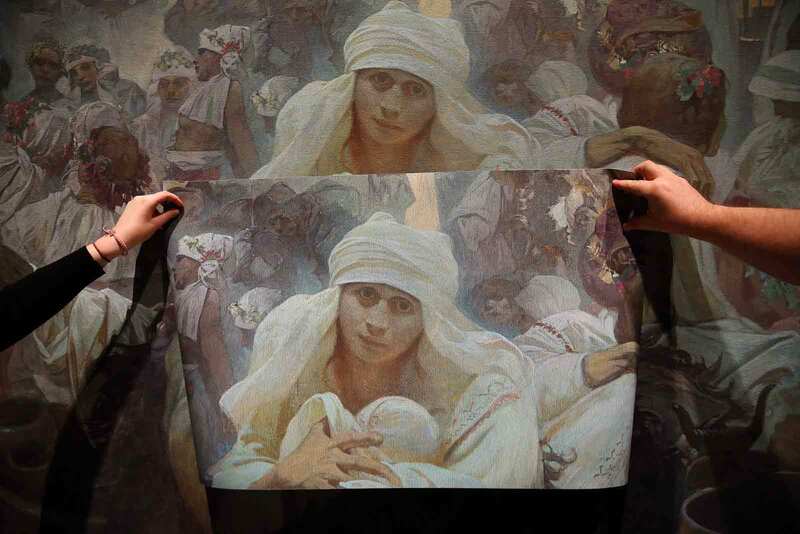 It is known that Alphonse Mucha spent eighteen years completing the cycle. Most of the work was carried out between 1912-1923 in the main hall in Zbiroh Castle, which Mucha rented from Prince Colloredo Mansfeld. Thanks to the financial support of the American industrialist, Charles Crane, he was able to create the masterpiece in the castle in which he brought his insight into the history of the Slavs. The Epic, he says, is an amazing piece of work that induces strange feelings. „The later the canvas was painted, the darker it feels,“ he says. There are not many joyful messages in The Epic. „Hordes of invaders, dying Comenius, war scenes strewn with the dead,“ describes Drnek. Jan W. Drnek has spent almost fifty years as a photographer. He shares his knowledge and expertise with students at the Department of Graphic Design in the University of Prague. In his work he focuses on the demanding techniques of panoramic large-format photography.